Revolution Renaissance, who are they? Take one look at the album cover and you have a clue. Do you see that logo? It's Timo Tolkki's new band which he created after the demise of Stratovarius. So this is what Mr. Tolkki is doing now. He mentions on his website that the songs for Revolution Renaissance were the future Stratovarius album. That's hard to believe because 'New Era' is a mediocre work. It is only saved from insignificance by the inclusion of Tobias Sammet (Edguy, Avantasia), Michael Kiske (Helloween), and Pasi Rantanen (Thunderstone) on vocals and Timo's normally fine guitar work. Otherwise, 'New Era' is a bore. Here's the run down. 'New Era' begins strong with 'Heroes,' a powerful melodic metal number which features Sammet on vocals and 'I Did It My Way,' a fine melodic hard rock number showcasing Mr. Kiske's outstanding vocals. The album goes down hill after this. It's hard to believe that Kiske or Rantanen would be associated with such mediocre songs as 'We Are Magic,' 'Born Upon The Cross,' 'Eden Is Burning,' and 'Keep The Flame Alive.' The second is a horridly disappointing and blasphemous number about Jesus Christ. This song, 'Eden Is Burning' and 'Keep The Flame' alive are so slow and prodding that no amount of espresso or alcohol will keep you awake or numb through their monotonous progression. The only saving grace is Mr. Tolkki's fret work. 'Angel' is a good, but ordinary ballad; pass on this one. 'Glorious And Divine' is a brilliant and satrical track satirizing cosmetic industry's desire to create the most beautiful people. (Tobi excels.) Thankfully, Tolkki redeems himself on the last two tracks. 'Last Night On Earth' is great melodic metal and Timo shows his great guitar skills. 'Revolution Renaissance' displays a social and political commentary wrapped in a catcthy melodic metal motif. Basically, here's the score: listen to the first and last two tracks and you will be impressed. If 'New Era' was destined to be the next Stratovaius album, then I'm thankful that they called it quits. Timo Tolkki can do better. He needs to gather around him some young (or seasoned pros unlike himself), innovative and impressive talent if he wishes to forge ahead to a new future. If you're a fan, I would say that you should secure this album. Otherwise, excerise your download options and only get the best tracks. 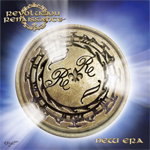 Revolution Renaissance's 'New Era' is a hardly a revolution or a renaissance. Let's hope for better days. Revolution Renaissance is the new creation of Timo Tolkki since the death of Stratovarius. But don't get your hopes up too soon. This is an average album that is only redeemed by a few songs thanks to guest appearance on vocals by Tobias Sammet and Michael Kiske. It starts strong and ends strong with several hiccups between. Otherwise, this work is simply a disappointment.